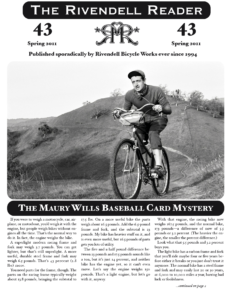 Rivendell Bicycle Works has existed barely ten years — and beginning even before its founding — has managed to engender almost continuous controversy, as well as outpourings of both unadulterated love and scorn. In 2006 it comprises merely ten people, plus a contract framebuilder and a painter for custom bikes, and a contract factory in Japan for production models. It has recently announced a French-style frame to be mass-hand-produced by Maxway, a respected Taiwan factory. It does nothing more radical than many other artisanal “bicycle ateliers” do, yet internet forums flame with contrary opinions over this tiny company, and both supporters and detractors have a tendency to get a little bug-eyed when engaged in frank and open exchanges of opinions on the matter. Rivendell builds bikes and sells parts, which is not particularly unusual in the bicycle business. So why, then, all the fuss? Perhaps it is simply that Rivendell, by virtue of its very existence (even if it didn’t regularly and emphatically speak its collective mind) exposes some of the gentle delusions (and sometimes outright lies) that the bicycle industry in America lives by in these early years of what will probably become — with the help of companies such as Rivendell — the Bicycle Millennium. The bicycle industry in the U.S. sells Technological Advancement! It sells Power and Mastery! It sells Big Air and Daredevil Skills! It sells World Conquering Fitness! And it sells a lot of racing bikes to people who don’t race. It also reluctantly sells a whole lot of lumbering, ill-fitted hybrids as city bikes to people who barely know how to ride; and it introduces its children to cycling on the garish, barely-functional imbecilities excreted through the just-in-time supply guts of Toys “R” Us, Wal*Mart and their ilk. (Even though they do the important work of introducing many young riders to bicycles). Whether you spend thirty dollars or three thousand, whether you buy TIG-welded Chinese steel or carbon fiber hand-laid in Midwest clean rooms, if you buy your bike through any sort of mainstream purveyor, you are most likely to end up with a bicycle you will rarely use. Perhaps even never use after the first few disappointing weeks of semi-use. 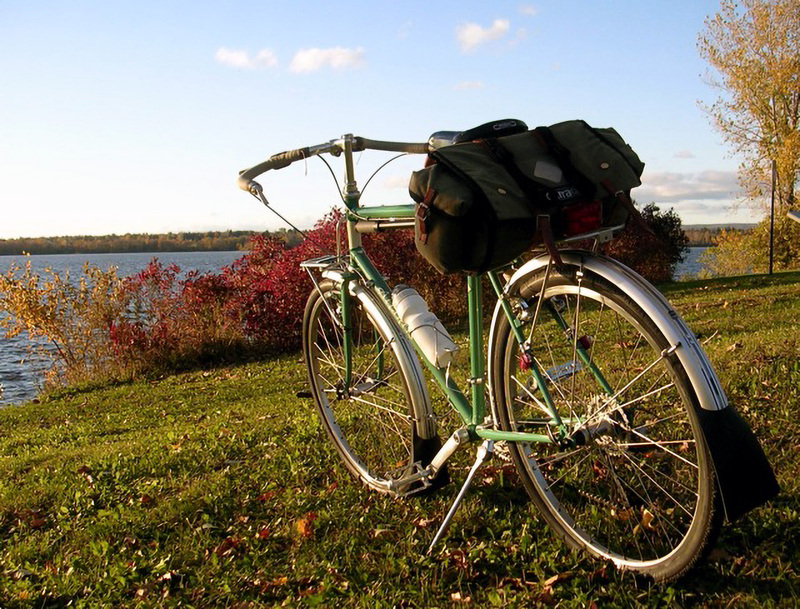 If you’re lucky and persistent enough to stick with bicycling despite the difficulties of buying a reasonable bike in the U.S. and riding it on the public ways, you will — if you haven’t much money — end up buying a used classic built between 1965 and 1985, or you will — if you do have money — go to an artisanal framebuilder and wait several months to get your new bike as built to your needs. Oddly enough, Grant Petersen, founder of Rivendell, feeds both those channels; custom and high-end production bikes through Rivendell, and classic 1980s designs through the dwindling but revered remnants of Bridgestone’s bicycle production during his stewardship there in the late 1980s and early 1990s. We’re a ten-year-old manufacturer and mail-order bike shop for bike riders who prefer traditional, classical bicycles and parts and accessories to today’s ever-changing high-tech fare. Sometimes people hear “classical” or “traditional” in the context of bicycles, and think turn-of-the-century highwheelers or ’50s ballooners, or English three-speeds, or restoring vintage racing bicycles. Those are good pursuits, but they’re not our deal. We just like to ride bikes, and are more influenced by the pure, practical, and beautiful design ethics of the ’70s to late’80s. We offer gear for cyclists who can’t relate to the aggressive, thrill-seeking and/or body-shaping approach that passes as normal today. Our bikes are designed and built to withstand a lifetime of long, hard, fast riding and racing, if that’s what you’re up to, but we don’t go out of our way to appeal to the rambunctious, speed-before-all crowd. Some even blamed the moustache bar for the closing of Bridgestone USA, since a couple of Bridgestone models came with this elegant sort of curving flat bar. In fact, Bridgestone closed the U.S. bicycle division when the dollar fell too far against the yen to keep it profitable. Grant kept up the tradition of neotraditionalism with Rivendell — in fact, he now had the opportunity to run free with the concept, since it was all his show. So Rivendell offers not just lugged steel frames, but elaborate, nearly Victorian curlicues on the lugs. It lists not only the moustache bar but two or three new curves of traditional (non-ergo) drop bars. It even sells you a $2,300.00 custom frame, then suggests that you dress it with a twenty-dollar wire bike basket (made in a Kentucky hollow!) for shopping trips. Frankly, this shouldn’t bother anyone. If people want to buy it they will. If people don’t want to buy it, the business will fail. But they buy it. There’s a considerable waiting list for custom frames and production models often sell out in two or three months. It’s not a megacorporate business. It’s a mom-and-pop bicycle design and marketing firm, and it just gets by. But it offers something few other entities in this advertising-addled world do, and what it offers is just plain wonderful for real-world riding. One of Grant’s — and therefore Rivendell’s — fundamental dogmas is tire clearance. He feels that even a sporty bike should give you room to put a largish tire on. We’re not talking huge knobbies or anything here – maybe a 28mm or even 32mm tire instead of the 20-23mm tires common on sport bikes today. With room for fenders in case you commute and have to ride in the rain. And to allow you the freedom to ride a gravel road if life takes you somewhere interesting. You can always use a small tire if you want to, if you only ride fast on smooth roads. But on most modern road bikes you can’t find (or often use) anything else. And most modern hybrids are something you wouldn’t want to ride long or far, as they’re just not comfortable after the first two or three miles — the upright seating puts all the load on your back, the handling is heavy and they are molasses slow. So Grant says, make road bikes that can go beyond their definition. And this irritates the hell out of those who have defined the modern road bike. What? Steel? Not carbon fiber? What? Elegant and inexpensive quill stems that let you adjust your bike without buying a sack of spacers? For added emphasis: What? Leather saddles still made to a design over one hundred years old? What? Bar-end shifters instead of integrated, never-quite-in-adjustment brake/shift levers? What? Long wheelbases, instead of ultra-quick handling for cutting off the other guy in a sprint? Blasphemy! Burn them at the stake! And they label Grant a Luddite. They don’t look at the exotic steels he specs for his frames, or the finely-tuned geometries that make his bikes both quick and stable (as Bridgestones also were). They just see something that looks quaint, and that is attempting to redefine the market for bicycles, so that they are not seen as expensive toys for overgrown-but-wealthy adolescents, but as tools for interacting with the world, with society, with an economy that doesn’t depend on waste and false obsolescence to keep it going. The future, after all, belongs to the bicycle. Just not to the carbon-fiber whiz-bang wonder which — for all its speed — is as delicate as the racehorses it has supplanted in our cultural imagination. In a world where the choice has become a bicycle thoroughbred or a bicycle mule, Rivendell sells saddle horses. Maybe the U.S. bike industry is really afraid that people will just notice what’s going on. Because Rivendell believes that bicycles are important in the bigger world, it sells bicycle accessories that seem odd to anyone raised on bikeshop glitz and catalog splash ads, and it sells things that have nothing, really, to do with bicycles per se, but everything to do with the way of life in which bicycling is ideally a part. It sells bicycle bells — not cheap sweatshop-molded tringle bells, but beautiful brass ones from Japan, with a plaintive yet penetrating tone and a simple elegance that enhances the curves of Riv’s Nitto-made handlebars. It sells absurdly expensive cloth and leather saddlebags that will last for two decades of daily commuting. It sells wool jerseys — not just wool, but plain wool, lacking even a single garish logo! It sells, famously, Grandpa’s Pine Tar Wonder Soap, the best bath bar ever. It sells beeswax in paper cups. It sells hatchets, pencils, erasers and fenders — each one the absolute best of its kind, mostly in the context of adventure cycling but also life at large. And it has just introduced the Bleriot, a handmade-in-Taiwan lugged steel “camping bike” in the French tradition — one that uses 650B wheels, a size that was always rare in the U.S. but that has never died out in Europe or Japan. It’s beautiful, sturdy, flexible and relatively cheap. And it will be available through QBP (Quality Bike Parts), meaning any bike shop anywhere will be able to order one, and the wheels for it, if you want. So now there are more choices in front of you than ever before. In the Bella Cosa book Bicycles (Le Biciclette), you can see a photo of the Coventry Swift Dwarf Safety Roadster, the first modern bicycle –meaning one with two wheels more or less the same size and with chain drive. It came with a suspension fork. In 1880. You can also see a Softride-style bike, though its seat beam is made of laminated steel rather than carbon fiber. (Naturally, Rivendell used to sell this book). You can read an illustrated article (in the Rivendell Reader) on classic French bicycles, and you will see cantilever brakes on aluminum frames as far back as 1930. You can see that most ancient bikes were welded, and that lugs were a step forward in strength, lightness and style — and you realize that it took welding 100 years to catch up with lugs, and did so only after the development of supersteels such as Reynolds 853. And after you ride a few bikes of different types, you realize that in many cases, a well-made lugged steel bike just feels better. And it certainly lasts longer. And it’s easy to fix if it breaks — and it’s worth fixing if it does. You realize that future and past trends don’t matter so much, that it’s really bicycling that matters, and that when bicycling matters, oftentimes it’s bicycles in the style of Rivendell that really matter most. Grant very really, quietly and persistently wants to change the whole wide world. He believes that bicycles can save us from ourselves, from our profligate natures and our self-centered, self-defeating competitiveness. And he is committed to supplying bicycles that we can ride into a better future. Call him Arms Merchant to the Velorution. This habit of subversion started with Bridgestone and the propaganda with the Bridgestone Owners Bunch (which still lives on as iBOB on the internet). It now continues with Rivendell, its membership program and the aforementioned Rivendell Reader. It’s a revolution that will return us to ourselves. And the movement is growing! Artisanal companies such as Kogswell, ANT, Vanilla, IRO and dozens of others will sell you elegant and fast commuter bikes, mostly of lugged steel, often with — yes — moustache handlebars, at price points ranging from absurdly cheap to staggeringly expensive. Even BianchiUSA — descendant of one of the original large bicycle companies — is selling a cheap drop-bar fast commuter with only nine speeds! Called the Castro Valley, it’s a fairly steady seller and you can be sure that sales of that sort of bike will rise in the post-petroleum, post-debt, post-consumerist economy. Concurrently, the fixed-gear fascination is spreading from city to city, with many young people rolling serenely down the street on bikes that can’t coast, bikes that require a real commitment to the bicycle (and its surroundings). 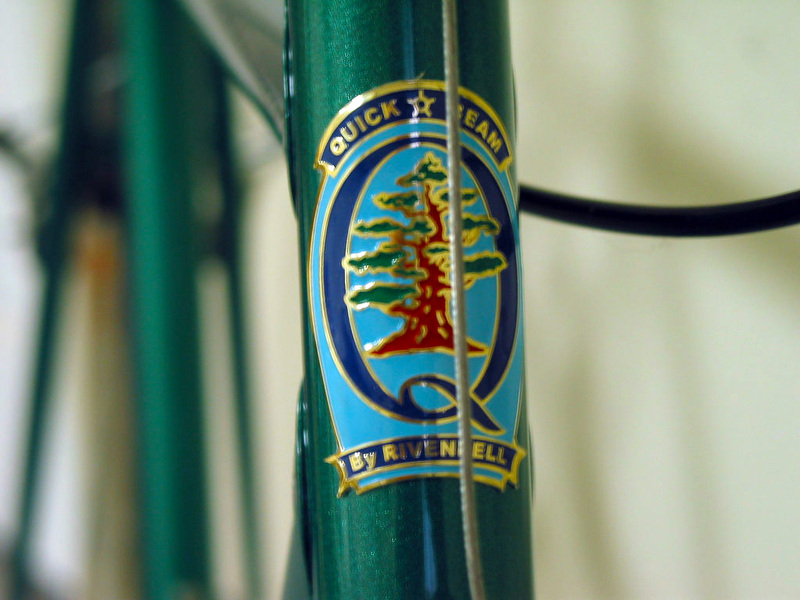 Rivendell, of course, now sells the QuickBeam, a ready-made singlespeed/fixie bicycle, and many more have recently jumped on that bandwagon. Other hipsters buy new-generation Dahon folders that fit neatly in their apartments. Icebike.org gives snow-country cyclists tips for year-round riding. And every day there’s a few more bicycle commuters out on the streets. That’s a good thing for us all. And so is Rivendell Bicycle Works. Well done. Thanks for choosing that picture to accompany the article. I’m flattered. 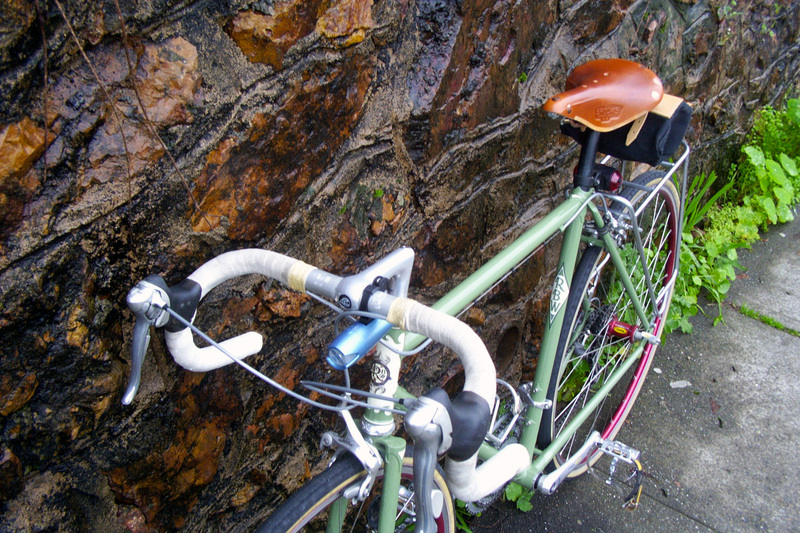 I love cycling and I love Rivendell – thank you Grant for my Nitto Albatross handlebars!!!! For me, cycling does is about fun, relaxation and enjoying life. It’s not a bad place to be. Keep up the fun work Grant!!! I dig Rivendell’s style and philosophy, but the prices are way too high to spark a velorution. Sorry, fellas, but there’s still no one selling a cheap, simple, utility bike in the US. Until there is one, Rivendell must be considered a failure, even by its own standards. So how much do those things weigh? The combined weight of myself and a Rambouillet, is under 200 lbs. Several years ago I got back into cycling. For two years I rode a cheap asia made “road bike” which was based on racing frames as most bikes today. I just felt the bike did not fit (I’m 6’5″). 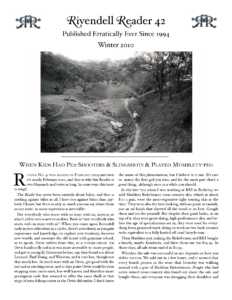 I found the Rivendell site and drooled over the bikes and liked what Grant had to say. I have been riding a Rambouillet for over 5,000 miles now and have to say it is a great bike. It also comes in frame sizes for us big guys although Grant is now threatening to stop making the big sizes since they don’t sell out quickly. As one of the earlier employees of Rivendell, I can say that more than 10 years later, Grant’s philosophies are still indeed very relevant. So much so that not only do I subscribe to his bicycling idealogies personally, I was inspired to start a company called Cycles Gaansari. God bless Grant, and others like him. But they might care about how their names are spelled. Maybe not. Thanks for pointing out the naming error. It’s appreciated and has been fixed. Please continue letting us know about any mistakes you find. I cannot follow your logic on this. How do you determine success. Rivendell has been around for a decade and they continue to bring new products to the marketplace. By all business standards I think it can be decided that Rivendell is a success. If you need to mass market a Tour de France carbon fiber 5 kg gizmo then I guess that Rivendell is a failure. sorry, but Wald baskets aren’t “made in a Kentucky hollow”, but rather in the river city of Maysville, KY, the original capital and first major city of KY a LONG time ago. I’s not a “hollow” of the mountain ilk at all, but rather characteristic of so many sleepy river towns along the Ohio and Mississippi, ones like Madison Indiana, Portsmouth Ohio. My wife’s from Maysville, and I choose to call you out for stereotyping a decent product just b/c it’s from KY. Fact is, the only thing that consistently comes out of KY hollows now is marijuana. I have a few comments about Rivendell. As a VERY small part time frame builder, I agree with the ideas that Grant has put forth in frame design. He didn’t invent these designs, neither did I, but they work for people who ride lots of miles and want to be as comfortable as possible. However, he has the thinnest skin of anyone I have ever met. I am the author of the letter currently on the editorial section of the Riv web site. I sent that letter because he promised 5 Readers a year. And he has never lived up to his own promise. His response to me for my question?? He kicked me out of Rivendell! It was an honest question and he totally over-reacted. He didn’t ask me what I meant in the letter, he just freaked out and terminated my membership without any discussion. Actually he made his hit-man John do the dirty work. But kick me out he did, and I find that to be very small minded, and very childish. If Bicycling didn’t publish even half of its promised issues, I bet people would be calling them too. I guess I will wish Rivendell good luck, because with customer service like that, they will need it. Your comments mirror the creepy manipulations of the Grant Petersen I knew for four years; you did not witness “thin skin” per se, you witnessed a control freak — in the worst sense — his intent is to induce guilt in you for which you do not deserve. As I knew him, he’d flip-flop with guilt and praise, of entirely pathologically manipulative origins and intents in him, just to keep me off-balance — two simple, pratical, and proven tools of the controller, not unlike domestic violence histories. As a matter of fact, during the last year I worked for him, he yelled at me over the phone, “Hey! I’m the only friend you’ve got!” Curiously, during that same week, his painter, Joe Bell, screamed at me exactly the same way, “Hey, I’m the only friend you’ve got!! !” Hey, given they both yelled at me the same, I guess that means I had two “friends” back then. Because the “membership” con means that you seek to belong to a group that gives you a great part of your identity, that’s a psychic weakness to exploit. Rivendell members don’t question, they go along with Grant, and he hates it when his copywriting lullabys miss a few, you being one of the missed. So Paul, join a health club or gym or take up poker or something. Maybe take up cycling. Joe, I remember your interview in the Reader. Glad to hear it isn’t me, but grant peterson. I saw many contradictions in his catalogs and readers. I bumped into a guy last weekend who knows the main builder for grant peterson( I see they have a second builder now ), he had nothing good to say about grant either. Like you, he told me that grant is a total control freak. A very unreasonable person. I am glad to be rid of the situation. Many great artists, musicians, and artisans have been of temperamental spirit. Whatever, Grant Petersen and his little company make great bikes. That’s what counts for the customer. Van Gogh had an attitude problem, and Beethoven had a heck of a temper. Creative people tend to have strong opinions about things – sometimes justified. Many artists, musicians, and artisans have been of temperamental spirit because they were habituated to marijuana and/or other drug abuse. Whatever, I don’t know if Grant Petersen is, has ever been, or will be a pothead, but I suppose it’s OK that his little company makes usable ankle reflectors. That’s what counts for the customer. Van Gogh had an attitude problem, and Beethoven had a heck of a temper, which is neither here nor there, but somewhere inbetween, for, associative marketing is, after all, about making associations. Creative mind-control people tend to have strong opinions about things – sometimes just refried. What’s the dillio with these new kaleidoscopey thingie avatars? I want a custom one. Turn it until I say stop. Not to get too far off topic 🙂 but I’ve got one of your Masi frames and it’s still going strong and feeling great! …I bought it at Yellow Jersey in Madison. It fits me perfect! Thanks for today’s post, seriously, can you sign up as a writer for wikipedia because the current pages submitted there for our interest is quite frankly garbage. I can’t say I agree exactly with it but I agree with it on the most part and I definitely applaud your effort in putting it so clearly.